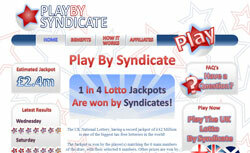 Play By Syndicate has clearly been inspired by eLottery Syndicate. The cost, syndicate structure and the way numbers are picked is exactly the same. There’s nothing particularly wrong with that as it’s a decent formula. The groups play the Wednesday and Saturday UK Lotto game, sharing 44 entries in each. Just like Big Fat Lottos, the 44 entries are arranged to ensure a guarantee that 1 ball will be matched every draw. So if you match your groups main 5 numbers, you’re guaranteed the 6th and hit the jackpot. It’s a simple idea but makes checking your results very easy. The cost to play is £5 per week, and you can choose to pay for between 1 and 10 weeks when joining. You can join online and pay using Google Checkout, which is a secure efficient payment system – particularly if you already have an account with the big G.
The cost however is quite high, and there is no apparent infrastructure here to justify it. I have to advise caution and say no to this one. It has only been running a few months, but the lack of transparency is a big red flag. I don’t mind that they copied the eLottery system, but charging the same price without apparently providing any of the facilities does seem to offer poor value for money. Significant and concerning lack of transparency, poor value for money, only a few months old. UPDATE: And PlayBySyndicate have now quietly disappeared… Try You Play We Play instead.